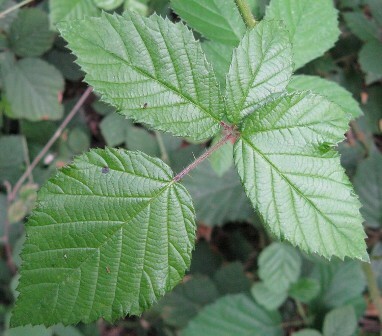 Other names: Elm leaved bramble, elm leaf blackberry, zarzamora. Holy bramble is one of very long lived shrubs. There is a holy bramble plant at the Chapel of the Burning Bush on Mount Sinai. There it is revered as the original burning bush of the Bible. 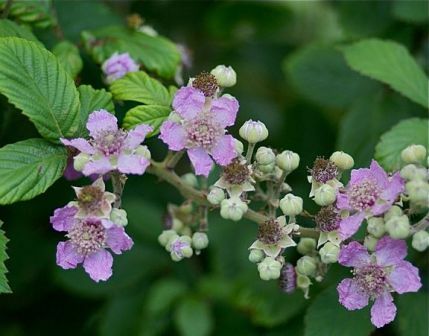 Holy bramble is native to Europe and North Africa. It bears small fruits, which taste quite good in spite of being somewhat dry. This fruit has been introduced widely all over the world. However, it has been found to be invasive and has therefore become a problem in parts of Argentina, Chile, Australia, New Zealand and the United States. It colonises natural and semi-natural ecosystems where it competes and displaces native plant species and degrades habitats negatively impacting native fauna. 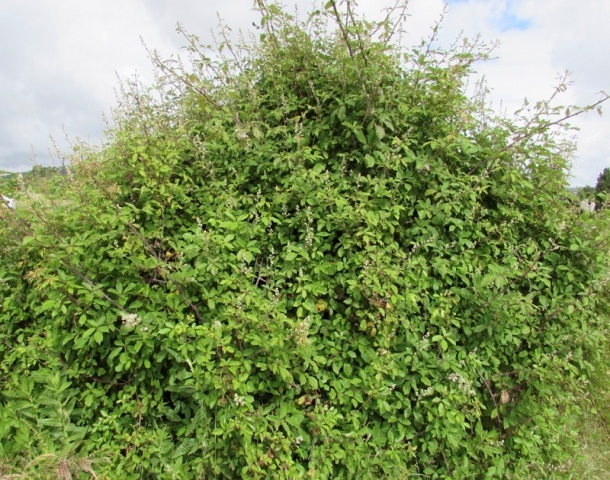 A large evergreen shrub, 3 m, unarmed or armed; stems biennial, erect, then arching, usually moderately, rarely sparsely, hairy, hairs stellate, eglandular, strongly pruinose; prickles absent or sparse to dense, erect to hooked, stout, 3–10 mm, broad-based. Leaves persistent or nearly so, ternate to palmately compound; stipules filiform to linear, 4–12 mm; leaflets 3–5, terminal ovate, elliptic, or suborbiculate to obovate, 4–10 × 2–6(–9) cm, base rounded to cuneate, unlobed, margins finely to moderately serrate, apex acute or acuminate to attenuate, abaxial surfaces with hooked prickles on larger veins, densely white short-velutinous, hairs usually minute, eglandular. Inflorescences terminal, 10–60-flowered, paniculiform or thyrsiform; pedicels unarmed or prickles moderate to dense, erect to hooked, densely short-hairy, eglandular. Flowers bisexual; petals usually pink, sometimes white, obovate or elliptic to suborbiculate, 5–12 mm; filaments filiform; ovaries apically hairy. Fruits black, globose to ovoid, 1–1.5 cm; drupelets 10–40, strongly coherent, separating with torus attached. The black fruits of holy bramble are are tasty and good to eat. These are eaten. Like fruits of most brambles, holy bramble fruits can also be made into jam or jelly. But it is done only by cookery enthusiasts as the fruits are not traded and have to be collected from wild only. A purple to dull blue dye is obtained from this fruit. The root also yields an orange dye when mixed with salt. Suitable for: light (sandy), medium (loamy) and heavy (clay) soils, prefers well-drained soil and can grow in heavy clay and nutritionally poor soils. Suitable pH: acid, neutral and basic (alkaline) soils and can grow in very alkaline soils. 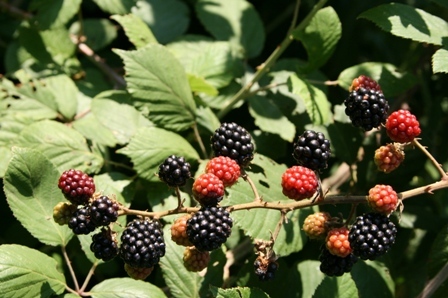 Holy bramble can easily be grown in a good well-drained loamy soil. However, it does best on chalk or clay soils, preferring open habitats in the wild. New plants can be raised from seed as well as from semi-hardwood cuttings. The seeds require cold stratification at 3 C upto 6-6 weeks for optimum germination.